Q. What is the difference between a rug and a carpet? A. While the two words are frequently used interchangeably, a rug indicates a floor covering that does not extend across the entire room and is not secured to the floor (as in an area rug). A carpet indicates wall-to-wall carpeting that covers the entire floor in a room and is attached with tacking strips and glue so it doesn’t come up and cause a tripping hazard. Q. Why should I use KIWI to clean my area rugs? A. If your area rug gets a lot of foot traffic, and especially if it’s in a foyer or entranceway that leads outside, you should have it professionally cleaned. This is because all kinds of outdoor contaminants might be brought in, including a great deal of moisture that may cause bacteria and mold to grow. It is difficult to fully remove these kinds of toxins just by vacuuming and with cleaning products available to the public. Also, daily traffic will cause dirt to be ground into the rug’s fibers, making it more difficult to clean. It also makes sense to have an expert clean any rugs that have experienced bad stains. Without regular maintenance, rugs will also wear out over time. A thorough cleaning will not only make a rug look like new again. It will also extend the life of that rug. Dirt and other contaminants will be abrasive against the rug’s fibers, eventually wearing them out. However, with proper cleaning by an expert, a quality rug can look beautiful for many years. Q. How often should rugs be cleaned? A. The answer to this question greatly depends on the type of rug and where in a home, office or public building it’s located. 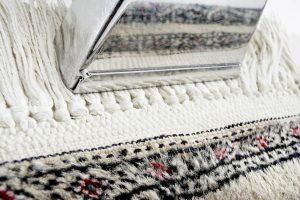 For rugs that experience normal wear, you should clean it every 1 to 5 years, depending on the amount of traffic it gets. For high traffic rugs or rugs in homes with pets, clean it yearly. In general, rugs in entrance ways, hallways, kitchens and bathrooms should be professionally cleaned every 1 to 2 years. Rugs in living rooms, family rooms and dining rooms can go between cleanings for 2 to 4 years. For bedrooms, most rugs only need a thorough cleaning every 5 years, and for wall hanging rugs, every 10 years. Q. How does KIWI clean rugs? A. Some cleaners immerse the rugs in a vat of liquid, which may damage more delicate weaves, but not KIWI! Our trained professionals hand clean every rug, giving special attention to every kind of rug so the cleaning is done safely. In addition to our cleaning services, we offer rug repair and restoration with nearly 30 years of experience. We know our rugs! Whether it’s an Oriental rug, Persian, Egyptian, Pakistani, Berber, Chinese or some other variety, we have the necessary expertise to make it look like new again. We use a 7-step process for our rug cleaning services. Q. Why is KIWI different from other rug cleaners? A. Our rugs are cleaned with our special pH balanced citrus cleaner that safely and thoroughly cleans while being friendly to the environment and to people and pets. In addition to being certified by The Institute of Inspection, Cleaning and Restoration Certification (IICRC), we’re also fully licensed and insured. Q. 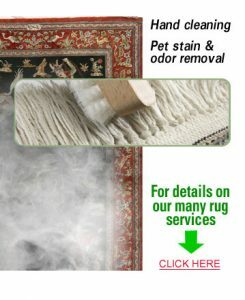 Can KIWI Remove Rug Pet Odor and Stains? A. We can! KIWI’s professionally trained and highly skilled rug cleaning technicians are trained in our Ozone Treatment where we confine our rugs in an odor-neutralized chamber that allows us to get rid of all pet odors and stains. We at KIWI are equipped to handle any rug pet odor or stain removal.